Luluvise goes live, but will this girl-only site attract more legal ire than eyeballs? Luluvise is a social and communications platform aimed at young women and their best friends where they can hand pick their best pals and network privately. Online pyjama party? I’ve no idea, I’m a guy. However, the idea here is to re-create the patterns of close female friendship online, and they’ve raised a $1 million in equity financing from Passion Capital, PROfounders Capital, and angels to do so. We wrote about their private beta launch here but now the service goes fully online today and they have some data to share so far. Plus, a sneak preview of a feature which may well land them in legal hot water. They’ve had 69 different countries represented on the platform, the majority being split across the UK, USA and Canada. The average user has between 4-8 friends in her Inner Circle. Once a user has at least 3 friends in her Inner Circle, her usage patterns (number of scoops posted, time chatting on the site) all increase by about 70%, according to the startup. This chimes with research. According to some industry figures women generate more than 70% of the messaging activity on Facebook, spend more than 35% more time on social networks than men, and drive 80% of all consumer spending. 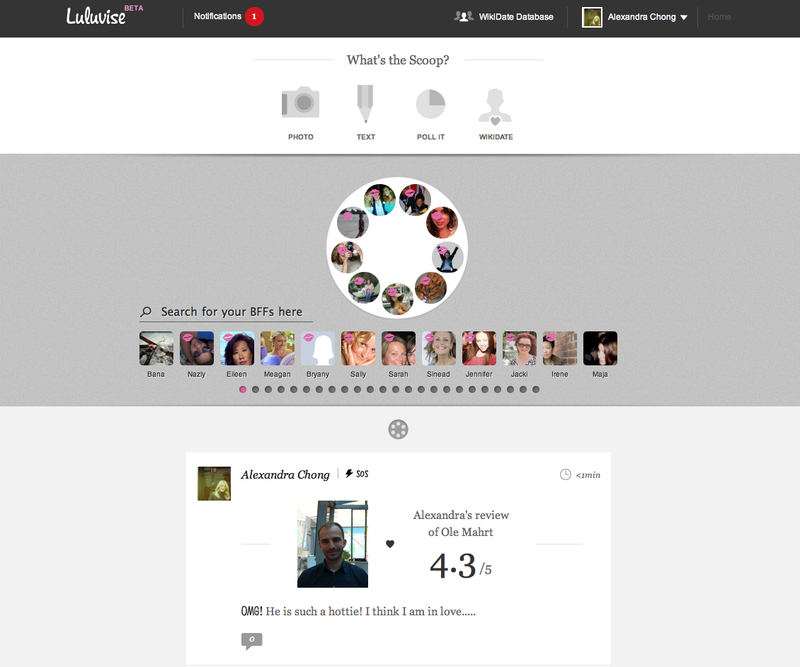 Of the 4 types of “scoops” or areas that can be created in Luluvise, Wikidate Scoops and Text Scoops were the most popular. The specific female-centric features most loved were the urgency buttons. Users can add an “OMG!” or an “SOS” to their scoops (yes, really) and almost every scoop created in the beta had one of these tags on it, accoroding to founder Alexandra Chong. And apparently a lot of guys want in. “We had a lot of guys submitting their emails to get access to the beta, and we must have sent out over 500 emails telling them Luluvise is for ladies only,” said Chong. Meanwhile, guys are going to find Luluvise interesting whether they can get in to it or not. There are already fake/false review appearing (here’s mine and here’s a carbon copy) which a guy can’t edit or respond to because, er, he’s a guy. These rate men on various things including whether they are “good in bed.” This is going to prove an interesting move for the startup given that although it’s technically a US company it’s physically based out of the UK, which happens to have some of the harshest libel laws in the developed world. Technically speaking, a man in a committed relationship may err, and then find himself “reviewed” on the site. Thus a “review” on a site frequented by women rating men on things like performance in bed could well be construed by a judge in a court of law that it has “lowered him in the minds of right thinking members of society” (as libel law would have it) since the man both claimed to be committed but had also been “reviewed” for his sexual performance by other women. All very well if he really is a philanderer (truth is a defence in law), but not so cool if a woman decides to “review” a guy she had not slept with but simply wanted to libel. The startup was founded in 2010 by Alexandra Chong, a former Global Head of Marketing & PR for Upstream and Director at the Corporate Executive Board. The team is 10-20 people, based in London, but the company is incorporated in the US.